Is holiday cheer creeping into the psyche of your classic horror film loving pal? Need something a bit, hmm, visceral? Bookmans offers alt-holiday entertainment with old-fashioned horror to brighten your spirits. 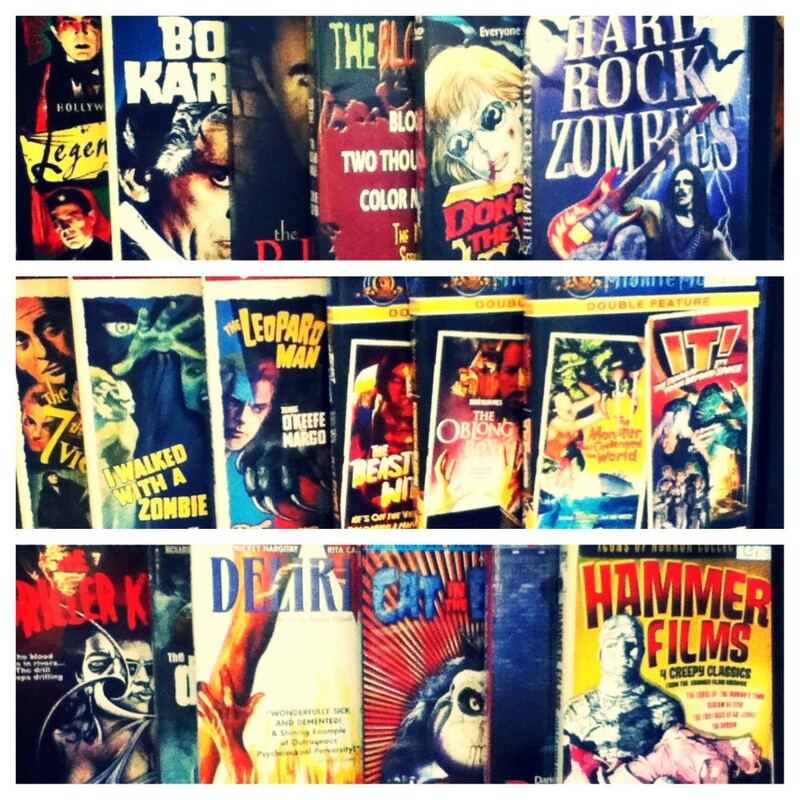 Bookmans has a goretastic collection of cult classic horror films. These high-quality, restored films include anniversary editions and double features. This heavy metal horror show features Jesse and his band on their “farewell concert to die for” and features a cast of characters including Hitler. If campy horror gets you feeling like a snuggle with your spotter, then pick up a copy of Cheerleader Camp, where perky cheerleaders meet a menacing psycho killer at Camp Hurrah. This high herkie stars Leif Garrett and Rebecca Ferratti. If you don’t know who they are, boy are you missing out! Four campers embark on woodland fun when they encounter a crazed machete-wielding maniac in the 25th anniversary edition of Don’t Go into the Woods. Any movie with a bright yellow sticker reading, “Warning: This motion picture depicts scenes of graphic violence,” is a perfect holiday choice. If one crawling terror film isn’t enough, try a Midnite Movies double feature like The Monster that Challenged the World paired with It! In The Monster that Challenged the World, giant mollusk monsters attack California. It! claims to be “too terrifying to even have a name” and one man plans to use it to his own advantage. As a bonus, the discs come with fun facts. The Oblong Box is the first big-screen pairing of Vincent Price and Christopher Lee. Price and Lee work together again in Scream and Scream Again. Not only are these movies super fun, they provide a cinematic education. When a double feature isn’t enough, pick up the Blood Trilogy. Blood Feast (1963), Two Thousand Maniacs (1964) (sadly without a Natalie Merchant cameo) and Color Me Blood Red (1965) claim to be, “the most shocking series in horror history.” We aren’t convinced. We will wait to see what Grandma says about that. We wouldn’t do this collection justice if we forgot to mention “an appalling amalgam of carnage and carnality” that is The Flesh and Blood Show. From the Pete Walker Collection, this film boasts that it has never before been released on DVD. A group of actors discover that their new rehearsal space is an abandoned pier full of fear. Special features include an anamorphic widescreen presentation. If you know what that is you might win a prize, somewhere else. Maybe a holiday party, or something. We don’t know. Slugfests, gargantuan vampire snails, morbid experiments, sadistic madmen and cheerleaders await you at Bookmans. Grab some eggnog and have a seat ‘cuz it’s the holidays at Bookmans! * Bookmans is your store to explore. If you are looking for a particular horror flick, please give us a call and we will check our shelves for you. Otherwise, we hope you will come and browse.